In the professional world there is the term “diamond face”, denoting the technique of making a pattern on a ring in the form of a notch. The pattern on the smooth surface of the ring can be varied, and the choice of offers in the salons is large: points, asterisks, dashes of different directions. The diamond face is applied, as a rule, on smooth rings with a flat surface of the hoop. The material used is gold 585 or 750 samples. Gold of the highest standard, such as, for example, 950, is not used, as it is a rather soft metal that can crack during operation. And then, the notches made on it will not be stored for a long time and will be erased. Also, the diamond face is applied to platinum, but this is more difficult and expensive work, because the metal is very durable. 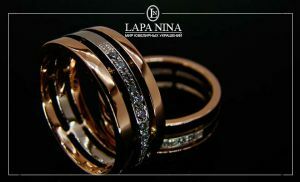 Now models of rings that combine gold and platinum with a diamond facet are considered fashionable and relevant. The design of such “double” rings (for example, the way of using different metals is a gold hoop inside platinum or vice versa, the type of pattern) may well not coincide with the bride and groom. The main selection criterion: individual wishes and preferences of the young. Recently, besides notches on the rings, an engraving of inscriptions is applied, which came to us from the West. The custom of carving romantic lines and words of love on the ring originates from the times of medieval Europe. Then the engraving technique on the inner side of the ring became widely used as a reliable way to perpetuate an important message. Since then, the techniques of jewelry work is very complicated. And engraving is used as the simplest method of inscriptions, which are applied by special incisors (manually or on engraving machines) or by etching letters, patterns and drawings with acids. – relief, when extra layers of material between signs are removed. There are also ways to make the letters stand alone. That is, the letters are made of metal, and between them the material on the inner surface of the hoop is cut out completely, leaving empty space, as in a cuticle. But this is possible only on convex rings with an internal cavity. 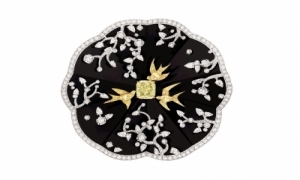 Special chic is considered to make an inscription on the edge of the diamond. 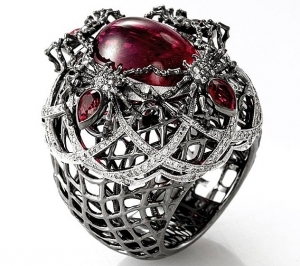 It is believed that this is not only very intimate, but also practical in case of loss or theft of the ring. Then, thanks to a special and rare sign – the words on the gem, the ring will quickly return to the owner. There was a whole direction in the design of rings, within which models of composite rings with hidden inscriptions-surprises are being developed. – “casket” or “medallion” – the ring is superimposed on top of another ring. They are mounted on a hinge, which is located on the side of the palm, and are connected to the upper side of the hand. The top hoop adorns the diamond, its rim masks the lock. Thus, the top ring is detached from the bottom hoop when climbing up. The secret inscription lurks on the flat edges of the rings, which are tightly in contact with each other when the ring is closed. Having decided on the design of the ring, you should think up an inscription. The message should be short and concise, not take up much space so that it can fit on a small ring and, at the same time, easily read. The name and significant date of the meeting or the day when the decision to start a family was made is well suited. And, of course, words of love and loyalty, as well as secret favorite phrases or traditional phrases invented especially for such a case in different languages. Words in English, Latin, French and other languages ​​of the Romance group (those you know) are often more suitable for engraving, they are shorter than Russian. Order engraving can be in the jewelry salon, where you get the ring. 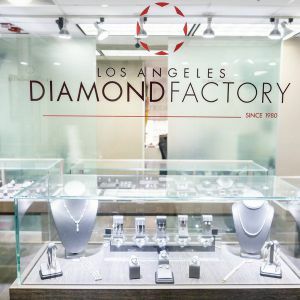 If the salon does not provide this kind of service, ask the consultant – he will probably tell you the address of the salon or the jewelry workshop where the engraving works are performed. The cost of work is determined by calculating the number of characters (letters, numbers) in the inscription, the type of font that is used, and how the order will be executed on the machine or completely manually. So, a unique technique, designed specifically for you by the master, openwork tie, when the letters are intertwined with each other in a sophisticated pattern, is valued more expensive than an ordinary font. 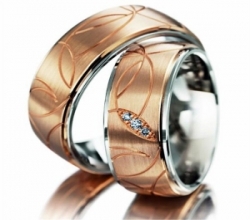 The romantic message that bears the wedding ring is one of the best ways to make your gift to your beloved one unique, to give it a special meaning.